“Book Bound By The Sea” is just around the corner and it’s going to be a packed house! When you put dozens of like-minded authors together in the same place, it is nothing short of magic! Here are ten signs you’re ready for “Book Bound By The Sea” if you still need some extra “oomph” to get signed up. Unlocking your story within is the biggest hurdle. Once you’ve accomplished that, the real fun begins! “Book Bound” will give you the tools to take your book idea and transform it into words on paper. You’ll learn techniques for “Mind Dumping,” dividing chapters and subchapters, productivity tips, and plenty more! Time for Round Two, already? Did you know the vast majority of first-time authors almost always become repeat offenders? Our “Book Bound” alumni are a testament to that! I’ve written and published dozens of books, yet am always learning something new as an author; being a student never ends! “Book Bound By The Sea” will undoubtedly offer a new perspective or friendly reminder, to help get your next book OUT of your head. Writing a book for your business or industry will instantly establish YOU as the expert. As the expert, you will gain unprecedented credibility and trust from your peers, colleagues and customers! I like to call it the “snowball effect,” as you’ll attract more business, speaking opportunities and respect. You’ve heard me say it time and again: you have a story and your story MATTERS. Each and every one of us has a unique story, just waiting to take form. Perhaps you’ve been through an exceptionally challenging life event, have dealt with personal crisis or have words of wisdom to share. Regardless what your story is, there is someone out there who needs to hear it. As an author, it is your duty and honor to share your story and impact the lives of others. The first step is simply believing in yourself! Where to begin? The ideas are flowing, you know your book idea, you even know your title–but where to begin?! At “Book Bound By The Sea,” we tackle the biggest obstacles to authorship. We uncover methods for time management, goal-setting, brainstorming and various writing techniques. I am confident, at the end of “Book Bound,” you’ll walk away with your book OUT of your head and ON to paper. Becoming an author leads to a plethora of new business opportunities; speaking engagements are just the tip of the iceberg. As an author, people want to hear from YOU, the expert. “Book Bound” alumni have gone on to become keynote speakers, hold their own workshops and seminars, or even spoken on a podcast or radio show. As an author, the opportunities are nearly endless. 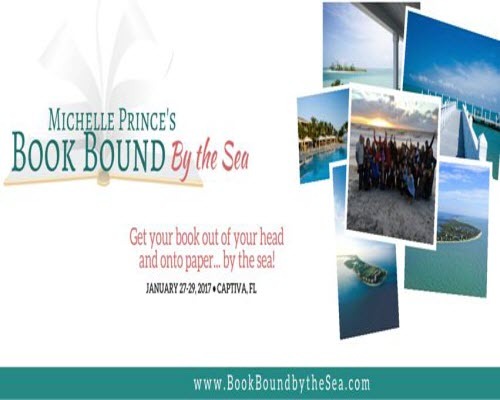 “Book Bound By The Sea” will teach you how to write, publish and market your book. And, the best thing: you maintain full rights to your work. I believe everyone who wants to be an author should have the opportunity to do so, and working with a big-name publishing house is not realistic for everyone. At the end of “Book Bound,” my goal is for each author to walk away feeling empowered, energized and capable of writing and publishing their own book. “Book Bound” is far more than just a writing workshop. It is just as much an opportunity for personal growth and discovery, as anything else. You’ll discover your STORY and why it MATTERS to so many; you’ll learn techniques for setting and achieving your goals. For many, “Book Bound” is the little extra nudge to get going on the path to realizing your biggest dreams. I can’t rave enough about our “Book Bound” community. In fact, I think many would say it’s more like a family than anything else. For that reason, they come back every year, ready for more! At “Book Bound” you’ll notice we’re quite the lively crowd; we share ideas, stories, heartaches, challenges and many, many laughs! Perhaps you’ve been craving a creative outlet or need to reconnect with some form of self-expression. “Book Bound By The Sea” offers a multitude of opportunities to do so. As long as you’re willing to commit the effort, honesty and openness, you will always be received with warmth and support. The list truly goes on and on…. So, what are you waiting for? We have a handful of spots still available, and I don’t want you to miss out! Lock down your spot today— before they run out. I can’t wait to see you there! Maybe you’ve been craving a creative outlet or need to reconnect with some form of self-expression. “Book Bound By The Sea” offers a multitude of opportunities to do so!